The current lineup of Charliehorse brings forth a boisterous sound filled with bona fide county grit and uncompromising rock and roll. You can just hear the southern snarl in Ben Wardlaw’s voice as he practically spits his original no-holds-barred lyrics of sawed-off shotguns, cars, women, family and trouble-makin’. The commanding sound of the Cody Russell’s lap-steel adds a brawny heft to the sound that just begs to be played in this genre of music. His equally impressive banjo picking, holds true to the energetic nature of the band and its hillbilly roots. Dave Bright is a hard-hitting beast of a drummer. In addition to being the living personification of what this band represents with his pearl snap shirts, boots and cowboy hat, he holds the whole thing together with pounding solid rhythms and remarkable beats. The funk-infused bass lines provided by Chad Cearly hold true to the intention of the music, while coating it with a sound dripping in raucous emotion. Isayah Warford, an overwhelmingly talented musician, whose sound is wild and robust while maintaining admirable technicality, has easily filled the shoes of lead guitarist. The culmination of these players, results in a music that is an amalgamation of country, honky-tonk, alt-country, funk, blues, rock and roll infused with a valid sense of cool. Their shows are not to be missed. 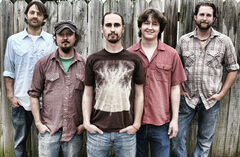 Due out August 2010, the band’s self-titled sophomore album is a testament to the legitimacy of Charliehorse’s appeal. The album was recorded in Austin, Texas with the Grammy-nominated sound engineering talents of Chris Burns at Summit Street Studios. The band utilized the creative-mind of Josh Zee of the award-winning band, The Mother Truckers, with the role of producer. Josh also lent his musical talents to the album by playing keys, harmonica and vocal abilities. Teal Collins, also from the Mother Truckers, added the female vocal harmonies to album as well.